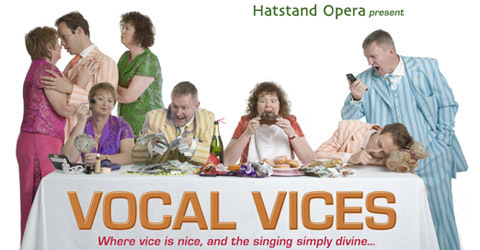 Vocal Vices: Ideal Dinner Entertainment! We’re off to a private dinner function near Bristol in a couple of weeks, where the entertainment will our feast of greed, gluttony, lust, pride, envy, wrath and sloth, Vocal Vices. We’ll be singing in between courses of dinner which is a great way to keep a flow of fine food and wonderful music all evening. People do ask if we sing while people eat, to which the answer is always no, as you can’t concentrate on two great things at once, us and the food! All of our shows can be enjoyed in this format, and it is also our most popular format for charity fundraising events, both inside during the winter and in marquees in the summer. If you fancy some Vocal Vices in your life, just get in touch! Over at our main Hatstand Opera blog, we’ve posted the top 20 opera highlights we sing, ranked by the number of times we’ve sung them, and the winner has been sung by us well over 300 times! But we’d love to know which one is YOUR favourite. So, click on this HSO blog link, which should open our blog in another window. Have a read, then add a comment and tell us which is your favourite! It’s time to celebrate with Hatstand Opera! Break out the bunting, bring a flag or two and generally have a super time with gold-winning opera, regal operetta and songs that glitter like diamonds. This a show to put you in first place for enjoyment and fun, and runs rings round anything else you’ll see this July (in a marquee in Surrey on a Saturday night)! It’s all in a good cause too, with profits going to our chosen charity this year, The Royal British Legion. Forget that ‘lost’ invite to the Buckingham Palace garden party, Lower Bourne Green is the place to be seen. So, book your table and join in the fun – hip, hip, hooray! Tickets: £15, bring your own picnic – tables & chairs provided, cash bar. Our new website is, quite literally, bubbling over with new info, new pics, new show info and a whole heap of other good stuff. Discover more about Hatstand at www.hatstandopera.co.uk. We’ve a brace of wonderful outdoor shows in September, taking us from a private garden in Surrey to the gorgeous Romney Marsh in Kent. So, why not join us in the autumn sunshine – yes, we must be due some by then! 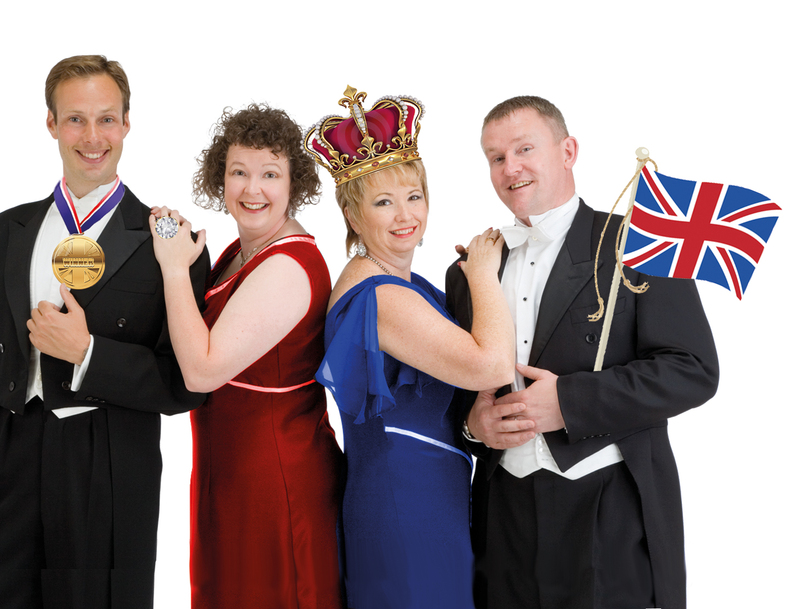 This fabulous evening in aid of Cherry Trees Respite Care gives you a unique chance to view an exclusive garden, and be royally entertained with great opera favourites, presented by Hatstand Opera in their delightfully light-hearted style. Most extracts are sung in English, including airline adverts, favourite tunes and something really unusual for the buffs, loads of laughs and much more. No need for subtitles, when compere and mezzo Kirsty Young introduces who’s singing what, when and why! Bring a picnic and your friends to this wonderful evening of magnificent music set in beautiful surroundings. There will also be a cash bar. A delightful evening of music and food in the rolling Kent countryside just half a mile from the sea at Haguelands Farm, home to Kent’s largest living maize maze, a superb Farm Shop, and a friendly herd of alpacas! Join Hatstand Opera for the very best hilarious scenes and heart-rending arias, where quick costume changes and informal presentation combine with top-notch singing for a great evening of music and laughter. Most extracts are sung in English, including airline adverts, favourite tunes and something really unusual for the buffs, loads of laughs and much more. No need for subtitles, when compére and mezzo Kirsty Young introduces who’s singing what, when and why! • cash bar serving local beers, wines and ciders will also be available. • If weather is bad, performance will be in a large barn! 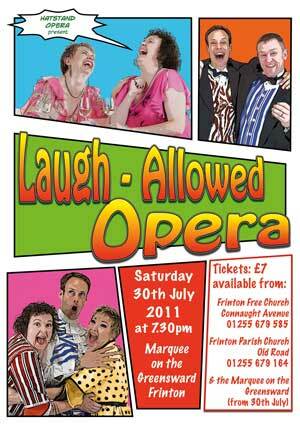 Fancy a chortle or a chuckle above the cliffs at Frinton? We’re performing our new show “Laugh-Allowed Opera” at Frinton-on-Sea in Essex this Saturday in the Marquee on the Greensward, a lovely location overlooking the sea and sands. Meerkats gift & toys – simples!